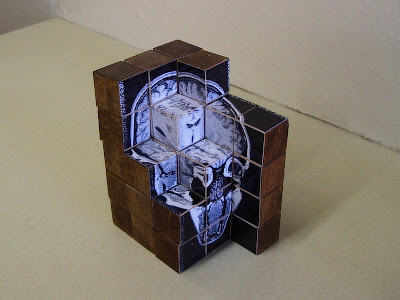 Neil Frasier got a brain scan, and put the cross-sectional images onto wooden blocks. Last month I took a left-right MRI scan, reconstructed it, and rerendered top-bottom and front-back scans. It was interesting to manipulate the data and extract information which while previously present, was not previously visible. Another method to visualize a complex 3D object is to build a model. The dimensions of the MRI data cuboid are almost exactly 3x4x5. Accordingly, I obtained 60 one-inch cubes (it's the USA, forgive the Imperial measurements), arranged them appropriately, varnished the 94 outside faces, printed nine carefully selected cross-sections and their mirror images, sliced the prints into 266 squares and glued them to the correct internal faces.